Complementing Kingsway Indoor Stadium's Group Fitness classes is the fantastic créche. 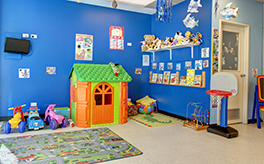 Kingsway's créche is a fun, friendly and safe environment in which you can leave your children, knowing they will be looked after and cared for by our qualified créche staff. The créche caters to children aged from eight weeks to five years, making sure each child's individual needs are met during their time in our care. Bookings are essential as places are limited. Please phone 9408 1920 to book.